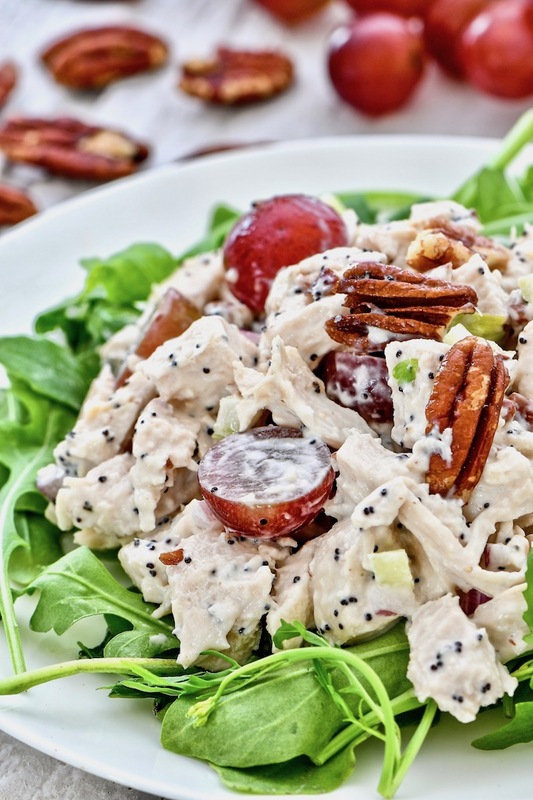 Chicken Salad with Grapes and Pecans a.k.a. 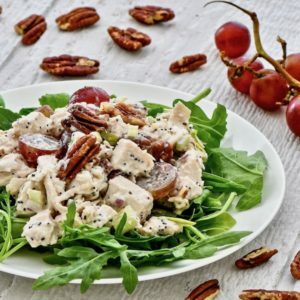 Sonoma Chicken Salad – chunks of chicken, grapes, pecans, onion, and celery, coated with a creamy poppy seed dressing. This isn’t your typical chicken salad. 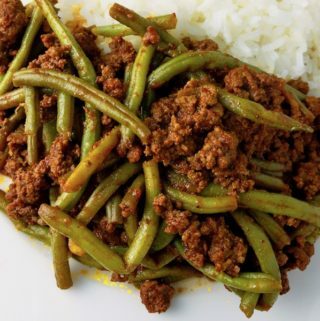 Part of my K.I.S.S – Keep It Short Simple recipes. I spotted this Sonoma chicken salad in the deli case at Whole Foods. I never tried it before and refused to pay the exorbitant amount of money they wanted per pound. One day, as I walked past that display case looking at all the delicious looking prepared foods, I noticed it was on sale. That particular combination of ingredients intrigued me. 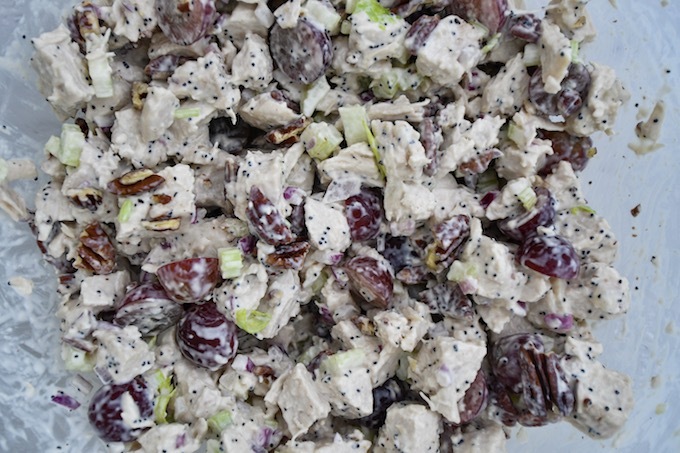 Grapes in chicken salad? It was good! A tiny bit too sweet, but that can be adjusted when making my own. 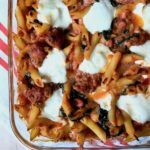 Recreating dishes at home is my hobby and it’s pretty simple when the ingredients are listed on the container. First, you need to poach the chicken breasts. 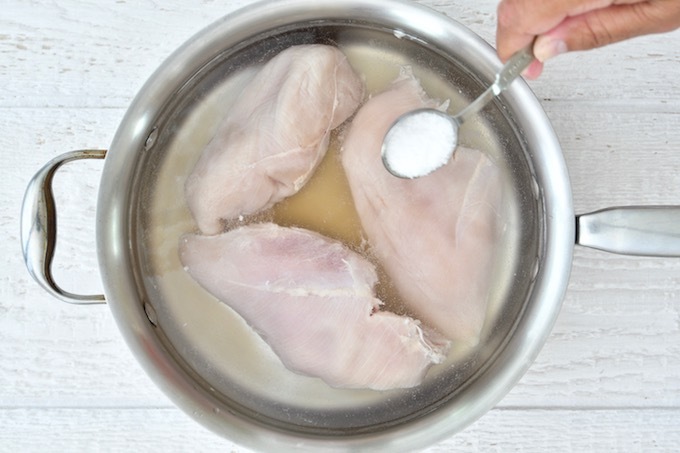 Simply place the chicken breasts in a skillet or a saucepan with enough water to cover. Adding some apple cider vinegar and salt will add flavor to the chicken while it’s poaching. Once it comes to a boil, remove from heat and cover the pan. Do not remove the cover because you’ll let out all the steam which is needed to cook the chicken. 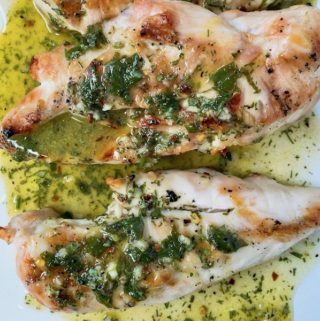 Let it sit for 20 – 30 minutes depending on what size chicken breasts you’re using. How does this work? Once the water boils, the pan is covered then removed from heat. The temperature of the water starts to go down, yet it’s still hot enough to cook the chicken without over boiling. A smaller sized breast – about 8 ounces – takes 20 minutes and a larger sized – about 10 ounces takes 30. I’ve been cooking it this way for over 15 years without fail. This technique was taught to me by a chef at a restaurant that served a delicious chicken salad. 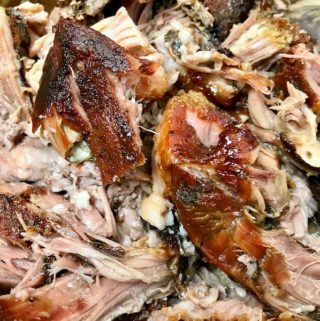 The texture of the chicken was moist and easy to chew. I asked the waitress what the secret was to the texture of the meat. She asked the chef who was kind enough to share. Since then, it’s my go to method for poaching. The only step I added was seasoning the water beforehand. Adding salt and some apple cider vinegar gives the chicken a head start to flavor. When the chicken is done, remove from pan and let cool. 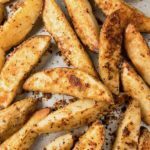 Once cooled, slice into bite sized chunks and mix with remaining ingredients. Take a bite, and test for salt at this point. Taste again until it’s right for you. 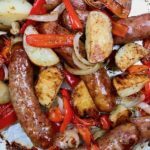 You get the chew from the chicken, the surprise from the grapes, the crunch from the pecans, the freshness from the celery, and the brightness from the onions. Don’t forget those little poppy seeds (affiliate link). 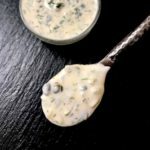 All that texture is combined with the creaminess from the mayo, the sweetness from the honey, and the slight acidity from the apple cider vinegar. Wow! So much going on. Want to make it even better? Make it with my homemade mayonnaise. 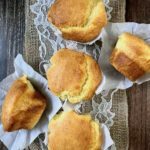 It takes 2 minutes to make with an immersion blender (affiliate link). And it’s so delicious, you can eat it with a spoon. All photos for this post were taken by the incredibly talented Ryan Gregory. 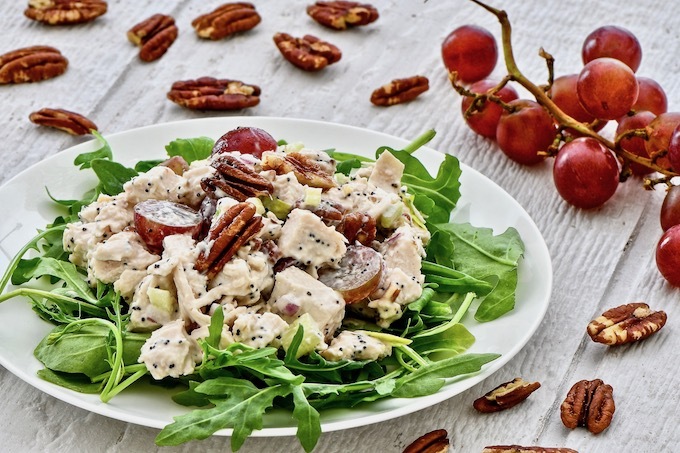 Sonoma Chicken Salad - chunks of chicken, grapes, pecans, onion, and celery, coated with a creamy poppy seed dressing, this isn’t your typical chicken salad. The combination of flavors and textures will surprise and satisfy. 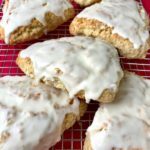 Part of my K.I.S.S - Keep It Short Simple recipes. 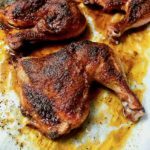 Place chicken in a saucepan or skillet and add enough water to just cover. Pour in apple cider vinegar and salt. Place over high heat and bring to a boil. Once it’s boiling, turn off heat, cover, and let sit for 20 minutes. Do not remove the cover until 20 minutes is up. For larger breasts do not remove for 30 minutes. Remove chicken from saucepan and transfer to a bowl and let cool. 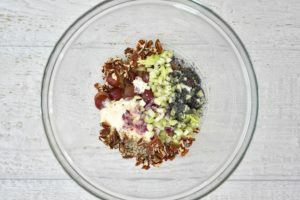 Meanwhile, in a large bowl, combine mayonnaise, grapes, pecans, celery, honey, poppy seeds, and pepper. 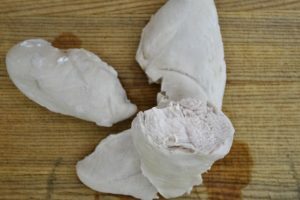 When chicken is cooled, slice chicken into bite sized chunks and place in bowl with dressing. Stir to combine. At that point, taste for salt. 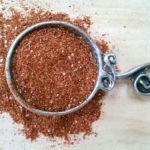 Add enough kosher salt to your liking. 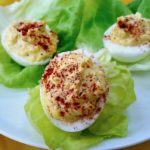 Serve on top of salad, on your favorite bread, croissants, or eat as is. Enjoy!